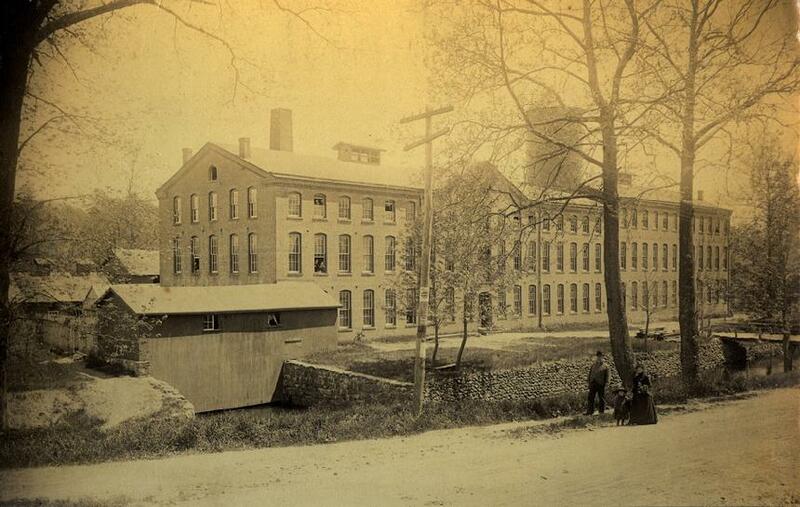 The "Web Shop" was an imposing brick structure of typical "mill" construction in Centerville. Its wood-frame predecessor burnt down in September 1875 (see article below). According to William Blake's A History of Hamden - 1786-1886, the new brick building was completed in January 1876. Numerous additions and alterations were made to the sprawling complex over the next several decades, as can be seen in the photos below. 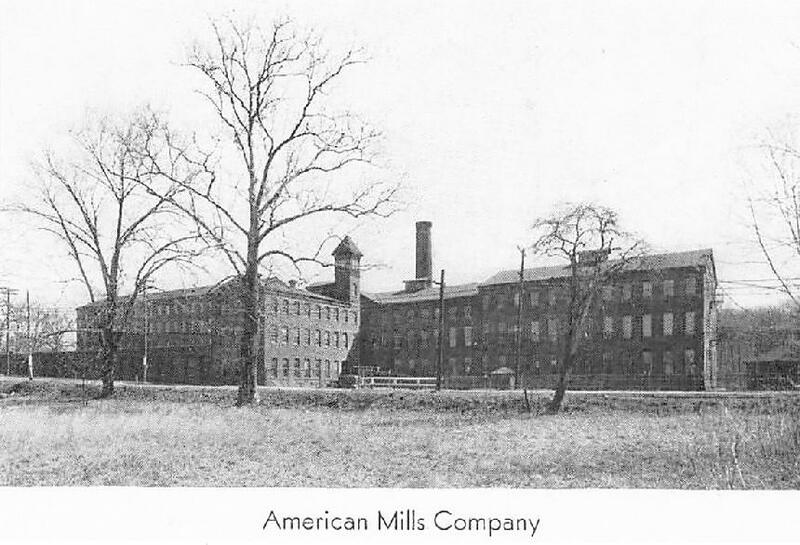 By the early 20th century, the building was owned by the American Mills Co. 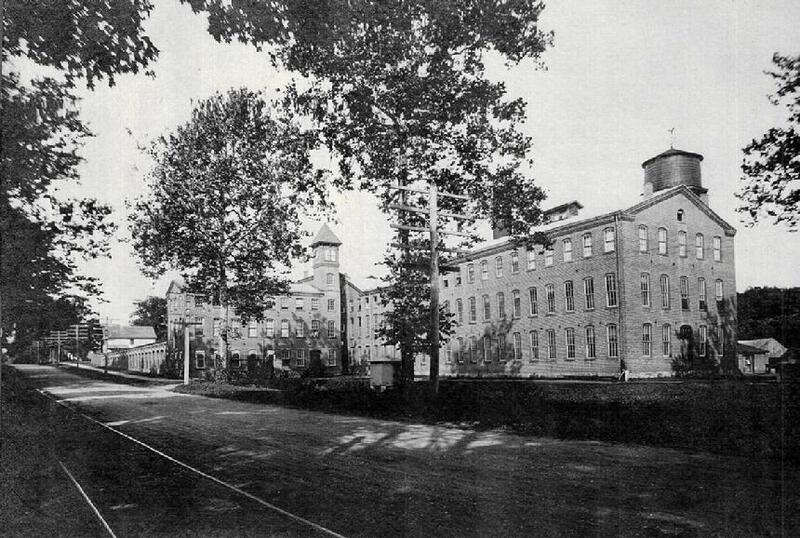 The entire complex, except for the executives' parking garage, was razed around 1940 to make way for the Wilbur Cross Parkway. 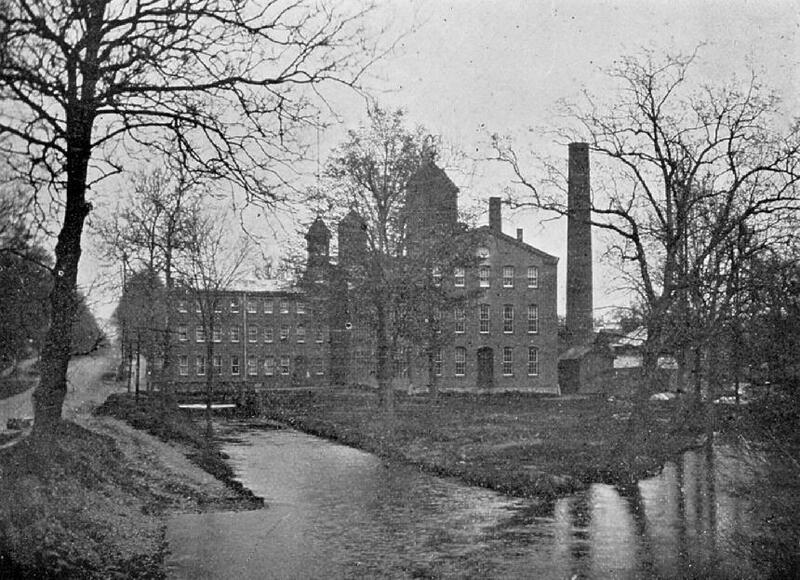 The above photo was taken no later than 1898. Another new wing had been added to the front (west side) of the original building, straddling the "race" that once provided water to power machinery inside the factory. 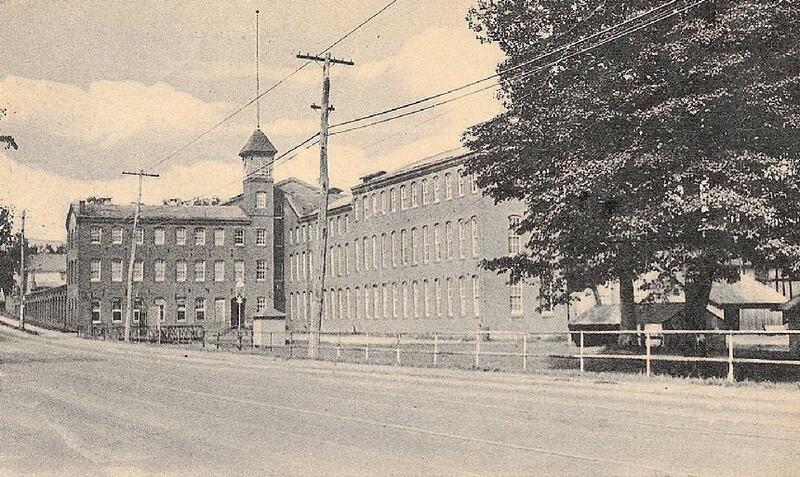 According to an article in the November 15, 1946 edition of The Hamden Chronicle (author probably Rachel Hartley), the factory whistle blew at 5:30 each morning except Sunday in order to wake the employees "in time to get to work promptly." 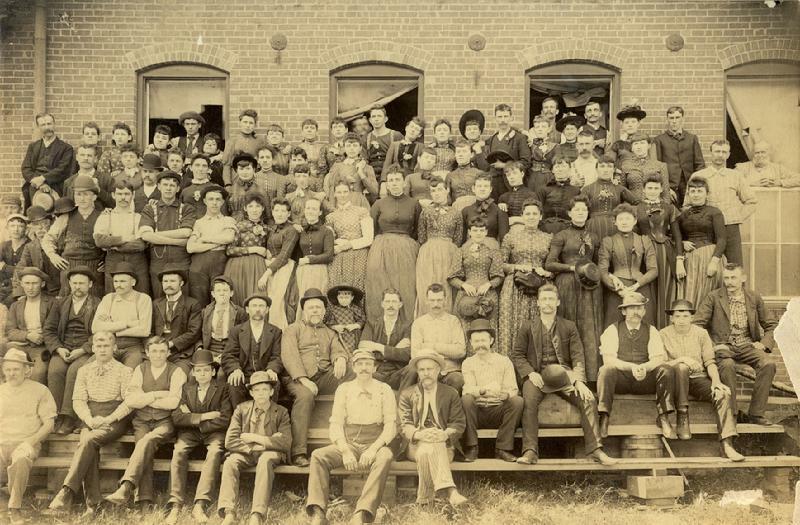 This displeased many of the area residents who did not work at the factory. In 1897, according to the article, the Web Shop whistle was blown "long and loud in triumphant celebration" as Whitney Avenue residents finally succeeded in getting the town to pave the street. The factory's whistle was also used to alert residents about fires, although until the Centerville Volunteer Fire Association was formed in 1907 there was probably little anyone could do but call the insurance company. 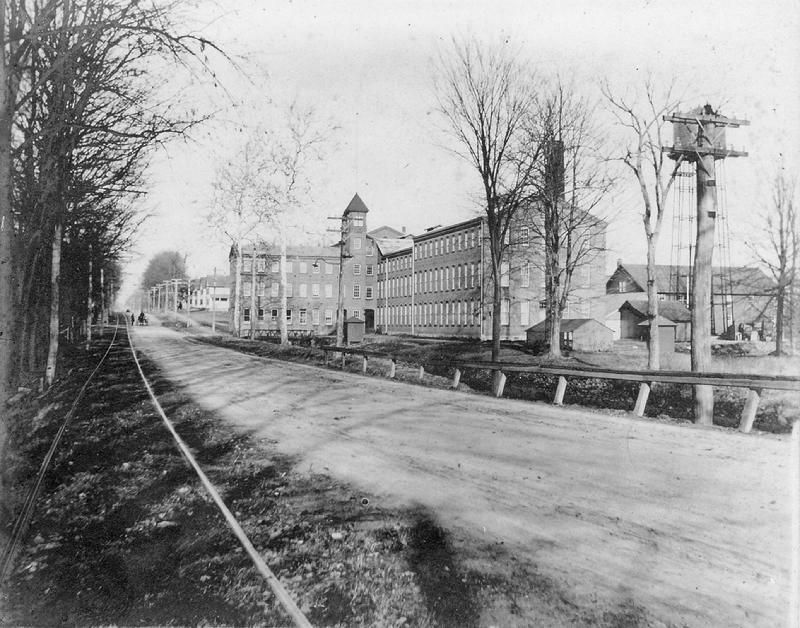 c. 1902 - Note the company houses beyond the north end of the building, and the horse and buggy driver conversing with a pedestrian in the distance. According to the aforementioned 1946 Hamden Chronicle article, the Web Shop's water tower, built in the early 1900s for fire protection, supplied mains that fed several hydrants in Centerville, as well as company houses on Whitney Avenue, Washington Avenue and School Street. 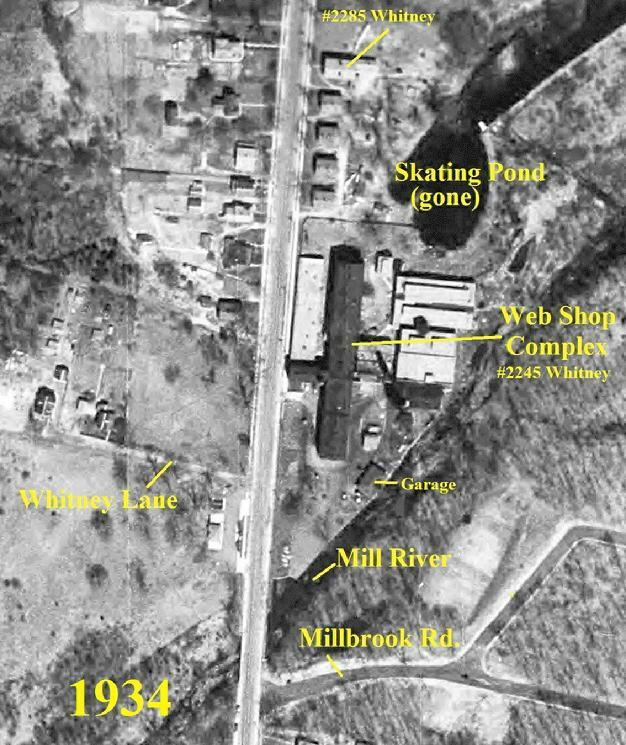 This 1934 aerial view (CLICK to enlarge) shows the Web Shop, by then owned by the American Mills Co., in context with its surroundings. 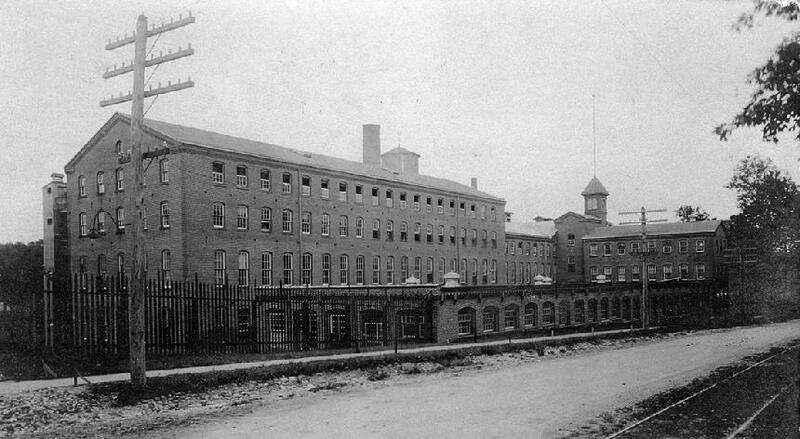 This massive complex now included several additional buildings. In 1939 the State of Connecticut bought the property for the future Wilbur Cross Parkway. The entire complex, except for the parking garage for the company's executives, was razed the following year. The parking garage remained for a few more decades as a storage place for Highway Department maintenance vehicles. 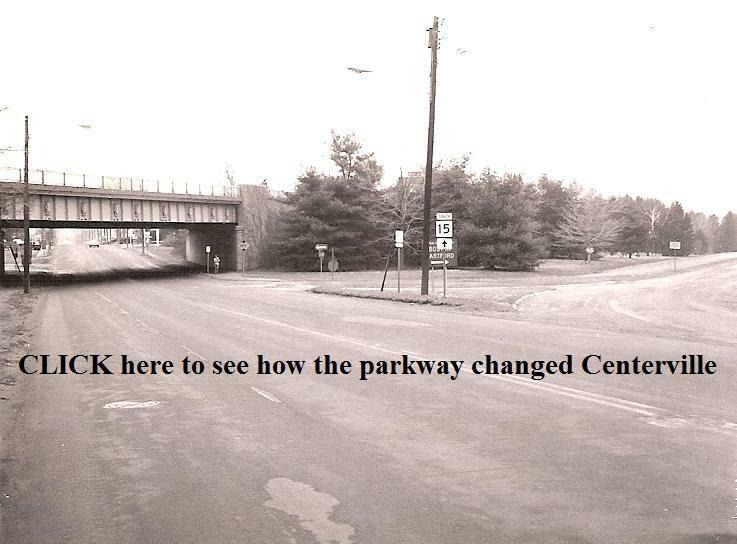 Tom Doherty recalls when the parkway was still under construction in the late 1940s, he and his buddies played on the unfinished roadway and skated on a nearby pond that is clearly visible in the photo. The pond was eventually filled in. One Hamden street, Whitney Lane, directly opposite the Web Shop, was totally eliminated when the parkway was built. There were several homes on the street, probably company houses for the Web Shop. The three houses immediately north of the complex were razed in September 1948 and a gasoline service station erected on the site. Razed and rebuilt in the 1960s, the service station is still there. The only structure pictured in this nearly 80 year old photo that remains standing today is #2285 Whitney Avenue (at the top), which later became the Carriage Drive Restaurant and is now a small store and office complex. This photo of the Whitney Avenue side of the building was taken from a vacant lot across the street. It was included in a Hamden Chamber of Commerce brochure that was designed to attract a new buyer for the factory which, by 1937, had closed down due to the Depression (note the 1937 Ford). March 1, 2013 - Today marks the 38th anniversary of one of the most famous, or infamous, fires in Connecticut history - the Shelton Sponge Rubber Co. Fire. So this week it seems oddly appropriate to feature a Hamden conflagration that destroyed a manufacturing complex that was of great importance to Hamden's economy exactly one century earlier. 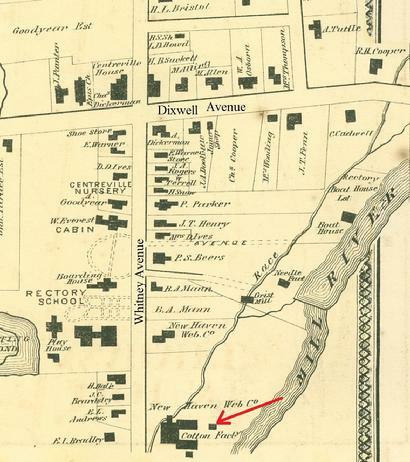 One of the most notable Hamden fires of the 19th century for which there is a newspaper account occurred on Monday, September 27, 1875, when several buildings owned by the New Haven Web Co. burned on the east side of Whitney Avenue at the Mill River (see 1868 map above), approximately where the Route 15 overpass crosses over today. 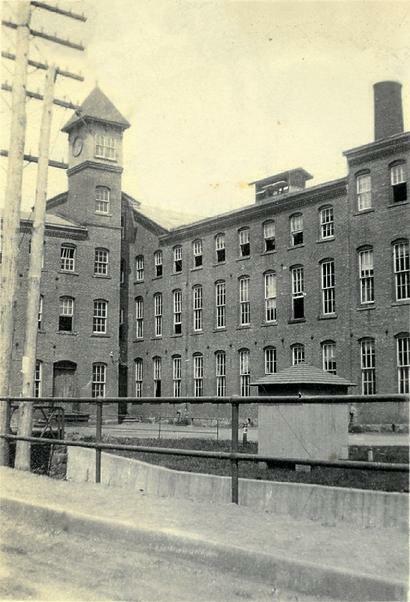 According to an article (at left) published the following day in the Hartford Daily Courant, the fire began in a small building at the rear of the complex and spread through a wooden shaft to other, larger buildings which were all part of the New Haven Web Company factory. Hamden had no organized firefighting forces or apparatus in those days. The entire complex was destroyed. 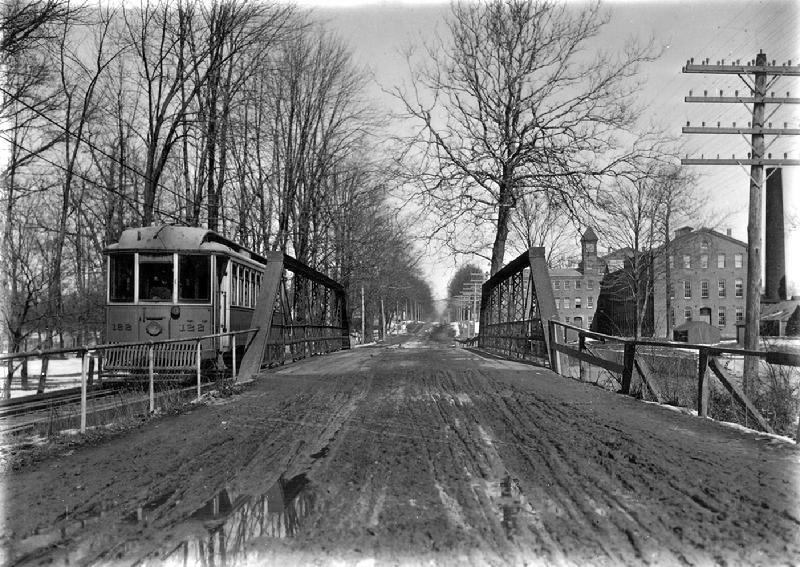 It was replaced shortly thereafter by a rambling brick factory, which remained on the site until it was razed around 1940 to make way for the Wilbur Cross Parkway. 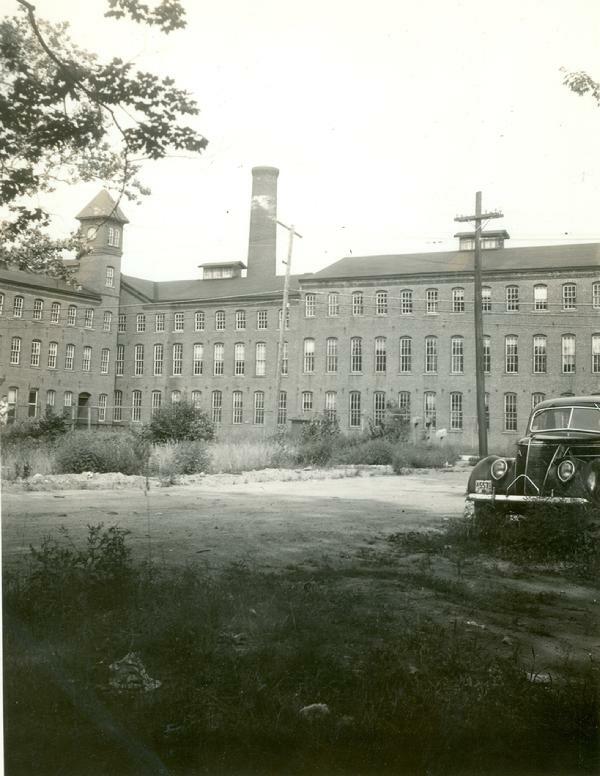 HFRA member Tom Doherty recalls that his grandfather and namesake, Thomas Doherty, was a dyer in a cloth factory in Taunton, Massachusetts, where he settled after arriving from Ireland in the late 19th century. Around 1900, the elder Doherty settled in Centerville with his wife and their ten children, which included Tom's father, Everett, who served on the Hamden Fire Department from 1927 until his retirement in 1966. While working as a dyer at the Web Shop, Mr. Doherty developed a process for making a permanent dye. Hamden's first full-time fire marshal, Albert Purce (1903-1978) and Hamden firefighter Mario "Bucky" Serafino (1909-2001) both worked at the Web Shop prior to coming on the fire department. Centerville Co. 4 volunteer firefighter, Edward D. Meegan, was employed at the Web Shop at the time he was killed in the line of duty in December 1927.